OUR PRODUCT (page 3) - DrK SKINCARE PRODUCT by agent hanny abdullah This side is about beauty product DrK skincare. The top product beauty care in market now. SERUM STEM CELL YANG DINANTI-NANTIKAN KINI TELAH BERADA DI PASARAN!!! TINGGALKAN PESANAN DI INBOX/PM JIKA ANDA BERMINAT! tinted and works as a replacement to foundation. Used as moisturizer, sun block, skin refining and lighten blemishes. BB magic cream offers natural looking coverage that nourishes, corrects skin complexion and protect against sun damage. Suitable for all skin types and best recommended for the maintenance of the skin's health. Visible results in 14 days! It is specially formulated to strengthen the lose skin, replenish the skin and restore its lost moisture and elasticity. 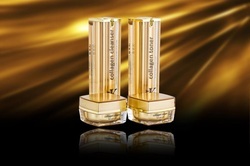 Collagen Series help to prevent the development of fine lines and wrinkles as a result of aging and excessive exposure to the sun.